Relizon Canada Inc.’s AS 40034 RELIZON-CDN jumped from #134 to #3 in the May 2013 for Canada All from CBL data. On May Day CBL saw 1 spam message from AS 40034 and more than 3 million on May 31. Relizon was not visible in the May Canada rankings from PSBL data, although internally we do see AS 40034 going from #208 to #109 by going from 11 spam messages in April to 26 in May. CBL’s heuristics or spam traps or both were apparently much better at detecting this particular spam source. Relizon’s own website doesn’t seem to be responding at the moment, but Bloomberg Businessweek says they do business process outsourcing solutions, and were formerly known as Crain-Drummond Inc., with the name change coming on acquisition by the Carlyle Group. This entry was posted in Economics, Forensics, IIAR, Intenret coordination, Internet risk management strategies, IT Security, Law, Reputation Systems, Research, spam, SpamRankings.net and tagged Canada, Carlyle Group, CBL, Crain-Drummond, Economics, Forensics, IIAR, Intenret coordination, Internet risk management strategies, IT Security, John S. Quarterman, Law, PSBL, Relizon, Reputation Systems, Research, spam, Spam ranked as a sneeze for infosec disease, SpamRankings.net on July 1, 2013 by John S. Quarterman. Canada’s The Hospital for Sick Children AS 46626 SICKKIDS-AS-01 dropped out of the May 2013 for world medical organizations from CBL data. In April they ranked #1 with 21,912 spam messages, and in May they dropped to #27 with only 28 messages. In April they really only spammed for one week, as you can see in the big spike in the graph. Of course, the hospital itself probably didn’t knowingly send the spam; usually they’ve been compromised by botnets or phishing or some other breach, but hospital patients and other customers won’t necessarily know that if they receive some of it. And if their security is lax enough to let in things that emit spam, what else has been compromised? This is why hospitals are quick to squelch outgoing spam and fix the underlying security problems. This entry was posted in Botnets, Economics, Forensics, IIAR, Intenret coordination, Internet risk management strategies, IT Security, Law, Reputation Systems, Research, spam, SpamRankings.net and tagged Botnets, Canada, Economics, Forensics, Hospital for Sick Kids, IIAR, Intenret coordination, Internet risk management strategies, IT Security, John S. Quarterman, Law, phishing, Reputation Systems, Research, spam, Spam ranked as a sneeze for infosec disease, SpamRankings.net on June 25, 2013 by John S. Quarterman. 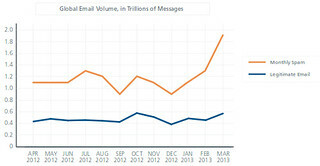 Zerofail’s AS 40191 AS-PRE2POST-1 jumped from 5 per day April 1st to more than a million spam messages many days in April, and from 413 total in March to almost 22 million in April. That made it #2 in the April 2013 for Canada from CBL data, and Zerofail kept second place in May with more than 18 million spam messages. This AS actually sent proportionally more of top 10 spam from Canada in May than in April because #1 iWeb’s AS 32613 sent a lot less in May. Where does all this Zerofail spam come from? AS 40191 has six netblocks currently assigned, of which the netblock 173.246.64.0/19 is producing almost all of the spam seen from AS 40191. This entry was posted in Economics, Forensics, IIAR, Intenret coordination, Internet risk management strategies, IT Security, Law, Reputation Systems, Research, spam, SpamRankings.net and tagged Canada, Economics, Forensics, IIAR, Intenret coordination, Internet risk management strategies, IT Security, iWeb, John S. Quarterman, Law, Reputation Systems, Research, spam, Spam ranked as a sneeze for infosec disease, SpamRankings.net, Zerofail on June 18, 2013 by John S. Quarterman. Medyabim Internet Services popped into the Turkish top 10 for May 2013, hopping up from #81 to #5. This happened starting about 23 May 2013, probably coincidentally about the same time as the disturbances around Taksim Square in Istanbul. Previous chronic Turkish spam winner TTNET 9121 made it back to the top, and this time TTNET placed twice, with AS 47331 as #6. Together the two TTNET ASNs sent 49.26% of top 10 Turkish spam for May 2013. AS 43391 NETDIREKT-TR and AS 42926 RADORETELEKOM battled through the whole month for spots #2 and #3. In better news, Tamer Gigabitweb Turkey and DorukNet IstanbulTurkey dropped out of the Turkish top 10. 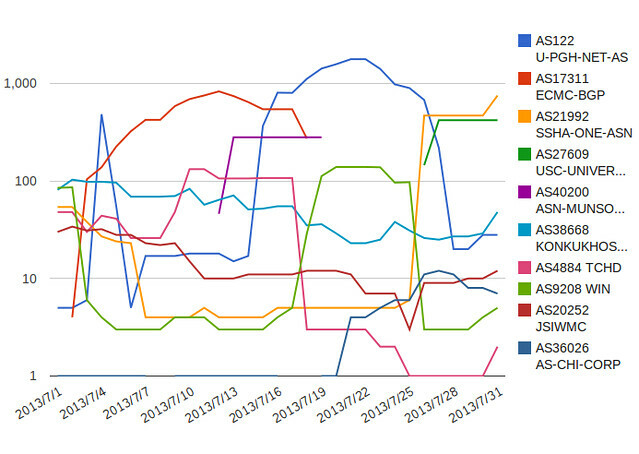 Also new this month are v2 rankings back to January 2013. This entry was posted in Economics, Forensics, IIAR, Intenret coordination, Internet risk management strategies, IT Security, Law, Reputation Systems, Research, spam, SpamRankings.net and tagged Economics, Forensics, IIAR, Intenret coordination, Internet risk management strategies, IT Security, John S. Quarterman, Law, Medyabim, Netdirekt, Radore, Reputation Systems, Research, spam, Spam ranked as a sneeze for infosec disease, SpamRankings.net, TAMER, TTNET, Turkey on June 13, 2013 by John S. Quarterman. Comcast shows some of the biggest differences between Version 2 and the old version 1 of for April 2013. Comcast is in the U.S. top 10 either way, but with different Autonomous Systems: AS 7922 is #3 in v2 while AS 7015 of Comcast Cable Communications Holdings Inc is #8 in v1 and doesn’t even appear in the v2 top 250. This entry was posted in Economics, Forensics, IIAR, Intenret coordination, Internet risk management strategies, IT Security, Law, Reputation Systems, Research, spam, SpamRankings.net and tagged AT&T Broadband, Comcast, Economics, Forensics, IIAR, Intenret coordination, Internet risk management strategies, IT Security, John S. Quarterman, Law, Reputation Systems, Research, spam, Spam ranked as a sneeze for infosec disease, SpamRankings.net on June 4, 2013 by John S. Quarterman.